Located in Lake Buena Vista, Best Western Lake Buena Vista - Disney Springs® Resort Area is a 4-minute drive from Disney Springs® and 8 minutes from Orlando Vineland Premium Outlets. This family-friendly hotel is 5.2 mi (8.3 km) from Epcot® and 5.6 mi (9 km) from SeaWorld® Orlando. Be sure to enjoy recreational amenities including an outdoor pool and a fitness center. Additional features at this hotel include complimentary wireless Internet access, concierge services, and gift shops/newsstands. Spending a day of fun is easy with the complimentary theme park shuttle. 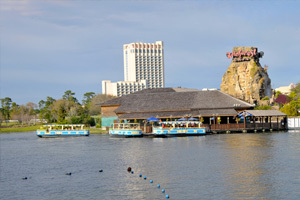 Grab a bite to eat at Traders Island Grill, one of the hotel's many dining establishments, which include 2 restaurants and a coffee shop/café. Relax with your favorite drink at the bar/lounge or the poolside bar. Buffet breakfasts are available daily from 7 AM to 11 AM for a fee. The preferred airport for Best Western Lake Buena Vista - Disney Springs® Resort Area is Orlando, FL (MCO-Orlando Intl.). This property is undergoing renovations from 01 October 2018 to 31 December 2020 (completion date subject to change). Renovation work will only be conducted during business hours. Every effort will be made to minimize noise and disturbance.